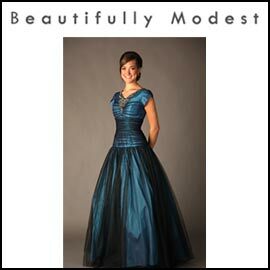 This dark blue prom dress by Beautifully Modest is regal and conservative. It's apparently also very popular. During our visit to the site, there was mention of a 16-week wait for this particular dress. We can understand why that's the case. The modest V neckline is accented with elegant beadwork, and the sheer black tulle gives the dress a classy appearance. If you think you want this dress: shop early!